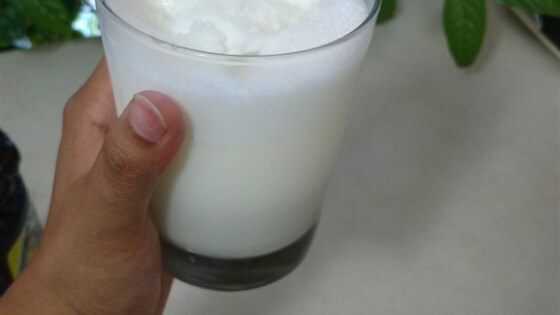 "Here is a basic recipe for Indian Lassi (yogurt drink). You can add more or less yogurt or water for a thicker or thinner beverage. For a salty lassi, you can substitute 1/2 teaspoon salt for the sugar. Garnish with fresh mint if desired." In a blender, blend the yogurt, ice, water, sugar and salt until mixture becomes frothy. Pour mixture over ice cubes in tall glasses. Watch how to make a refreshing mango lassi! Too watery. It's way better with ice-cold milk than water. Water is used only by Indian restaurants for profit. Real lassi is all milk and yogurt, no water. Delicious. Great way to eat dairy products. I had this for breakfast made with banana. I will definitely make it again but I think I'll reduce the sugar a little. I used a tablespoon of sugar, added a 1/2 teaspoon of rose water, and didn't add the salt. I used about a 1/2 cup of water and the consistency was perfect. Thanks for the great recipe! Very easy to make, and my boyfriend who is from India and grew up drinking lassi, loves this recipes. This was fast, easy, and delicious. I put a banana in, as it would have spoiled within a day, and garnished with cinnamon.